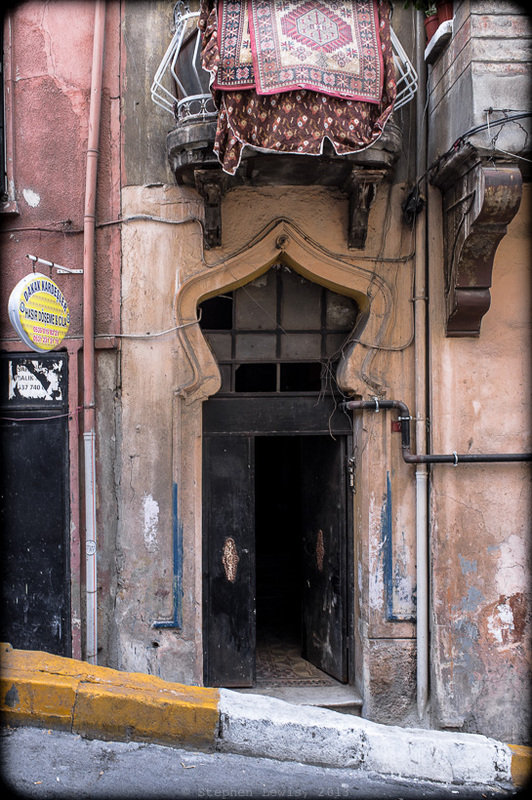 An archway at the entrance of a tenement in the lower reaches of the Tarlebaşı quarter of Istanbul, 2012. (Fuji X100) Click to enlarge. The streets sloping downward from the north side of present-day Istiklal Caddessi to Dolapdere Bulvari in the valley below are dense with late-19th- and early-20th-century tenements and apartment houses. Most are in disrepair but many have recently been restored as the area begins to undergo the preservationist benefits and human dislocations of gentrification and discovery by “cool” young westerners some oblivious of the lives of their neighbors and some enthralled by the seeming “romance” of the poverty … of others. The area was built up in the late 19th century by Istanbul Christians, Greeks mostly. It underwent a major demographic change following government-fomented anti-minority pogroms in 1956. With the forced exit of Greeks, the neighborhood became a haven for the traditional inner city poor and recent arrivals from rural areas: Turkish Sunnis, Kurds, Alevis, and Roma. The process of ghettoization was completed in the 1960s by the cutting of Tarlebaşı Bulvari, a multi-laned thoroughfare that served as a wall isolating streets immediately adjacent to Istiklal from those on the slope below. A relationship between typology and geography characterizes the area’s architecture. As a rule of thumb, the closer to Istiklal, the larger the plot and grander the structure; the closer to Dolapdere, the smaller the plot and more modest the house. The neighborhood’s apartment houses tend to be situated on the broader streets and its tenement row houses in smaller streets and alleyways. The closer to Dolapdere, the fewer and more modest the architectural decorative elements. This makes the archway in the photo above all the more curious. The archway above shows no relation to Ottoman styles nor to the geometric motifs of Anatolian Greek towns and villages. In one way, it appears to be a fantasy interpretation of Mogul architecture. More likely, given the time and the place, it might have been inspired by the so-called Moorish Revival style that arose in the Austro-Hungarian Empire following the Hapsburg annexation of Bosnia Herzegovina or, equally likely, by the eastern-influenced motifs of northern European Art Nouveau and Jugendstil. By incorporating an ornament inspired by the popular European orientalist fantasies of the time, could the Greek owner or builder of the house in question have been trying to assert his own modernity and self-styled occidental individual identity, this at a time of when Ottoman Christians were focused on national independence ala European nation-states?